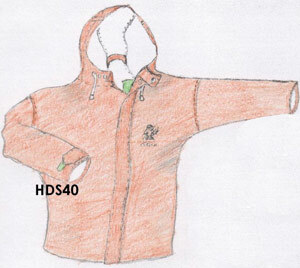 Features: Double secure storm flap, attached hood, drawcord, covered snaps, set-in sleeve design. HDX07 rated. GAGE Ragnar Jacket is named for ancient Viking warlord Ragnar Lorbrok, this heavy-duty protective garment is built to withstand the harshest elements and keep the wearer comfortable on any adventure. 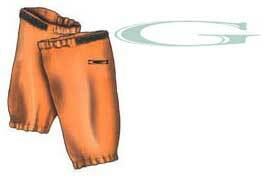 This hybrid design keeps the upper body warm and comfortable, while providing waterproof protection against the splashes, drips and sprays that are unavoidable when working or playing on or around water. 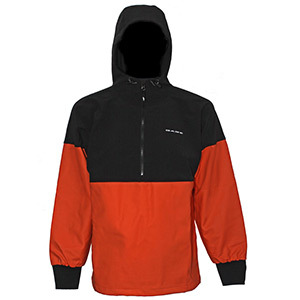 Features: This Ragnar Pullover combines two proven fabrics for warmth and protection. The wearer’s upper chest, shoulders and head are surrounded by a hearty softshell fabric that is windproof, water resistant and breathable. 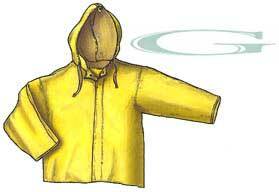 The lower torso and arms are protected by sturdy, waterproof PVC material over comfortable cotton. Technical features like fully welded seams, neoprene cuffs, hand-warmer pockets, the Gage Halo Hood and shock cord helm adjustments help seal body warmth in, while keeping cold and moisture out. 3/4 zip front. 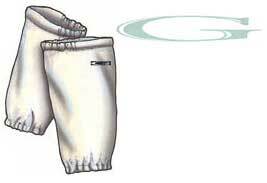 Description: Bib pants have a snap pocket on right leg, inside pocket in breast flap, velcro ankle closures. m2 PU coated polyester with 4 way stretch. Description: Knitted nylon with pvc coating that is lightweight, soft, and flexible. 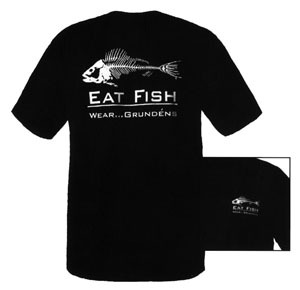 Elastic top, and bottom.Fish oil resistant. 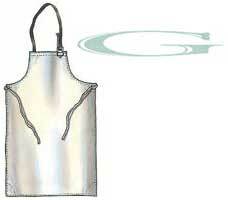 Description: A cotton twill material with a pvc coating of Grudens special formula. Elastic wrist and unique elastic/velcro adjustable top. 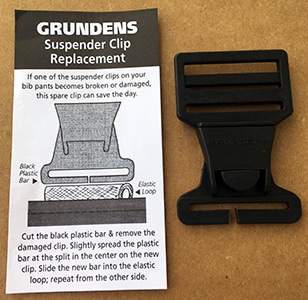 Description: Grunden's replacement suspenders. One size. 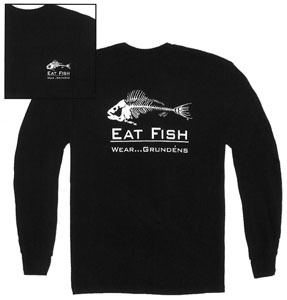 Description: 100% Cotton, long sleeve, full size logo on back, small logo front breast. Description: 100% cotton jersey, seamless double needle collar, sleeve, bottom hem, neck & shoulders. 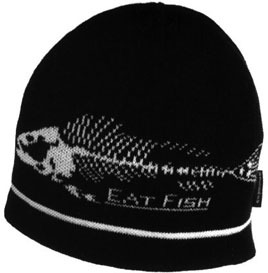 Description: Beanie has a comfort fleece band on the inside for better ear protection. 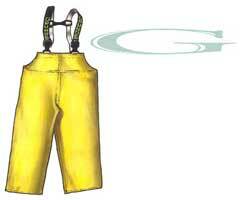 Bib design makes the trousers front-to-back reversible to lengthen the life of the garment. Suspenders made of 1 1/2" wide heavy-duty elastic materials so as not to cut into wearers shoulders when bending - avaliable with quick snap-in fasteners. Plastic cross bar remains flat on wearers back and spread the suspenders to distribute stress more evenly. Side gusset has two snaps for personal adjustment. Legs cut wide enough to step in easily and wear over boots so water runs off, not in. - Two sets of stitching along bottom hems. Hood made in three sections so that a cap or hardhat can be worn underneath with a raindrop-proof visor and trimmed side panels for improved protection while not restricting peripheral vision. 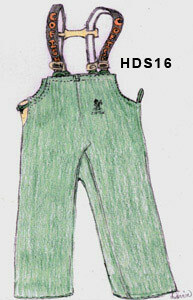 Longer and wider garment for full torsor with tapered sleeved. Durable hang loop at back of inside collar. Well-designed throat protector with rivet reinforcement at stress area. Inside storm panel - longer and wider with two stainless steel snaps to keep out wind and water. Velcro adjustment at wrist for personal comfort.